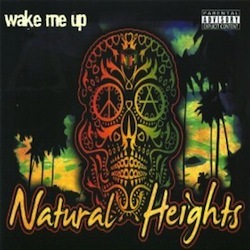 Wake Me Up is the 2011 debut effort by Riverside, California natives Natural Heights. Since forming in February of 2010, the band has performed with acts such as Seedless, Passafire, The Green, Rome and more. This album brings back memories of my summer vacations spent in Southern California. The main theme throughout the album seems to be about having fun, and living life to the fullest. Listening to the title track “Wake Me Up,” I was instantly drawn to the strong vocals of frontman Scott Hall. Every verse has meaning, and the bands' tight rhythms help back up every word. The natural sound of Wake Me Up is a great accomplishment for any band recording their debut project. Songs such as “Take Another” and “Hold Me Down” are definite additions to the iTunes Party Playlist. For fans of the laid-back vibe, “Nation Vibration” and “Right Time” are mellow jams perfect for lounging on the beach. The album speeds up with the energetic anthem “Crusin Cali,” a song dedicated to the golden state. “My Escape” is also a sweet track, with lightening fast guitar riffs and awesome drum fills. The ska songs on Wake Me Up sound just as great as the reggae songs. Natural Heights have the recipe for merging reggae, rock, and ska together into wonderful tunes. I look forward to hearing more music from the SoCal band. With a great musical sense and tight live show, the future looks very promising for Natural Heights.